The role of plastic in the design and manufacturing of automotive vehicles has never been more essential, with stringent regulations and changing consumer habits driving demand for more affordable, lightweight and fuel-efficient vehicles. Fuel efficiency has become one of the most important features in automotive vehicle design due to the rising fuel prices and stricter environmental regulations. This combined with high demand for automotive vehicles as well as rising disposable income in emerging economies will continue to drive demand for plastics in the automotive industry. However, while some materials may win from recent changes in the automotive industry, others will find themselves on the losing side, spelling serious implications for plastic producers globally. Currently, there are about 30,000 parts in a vehicle, out of which 1/3 are made of plastic. In total, about 39 different types of basic plastics and polymers are used to make an automobile. However, more than 70% of the plastic used in automobiles comes from four polymers: polypropylene, polyurethane, polyamides and PVC. Plastic has become one of the key materials required for the structure, performance and safety of automobiles in recent years, with growth in plastic consumption being driven by light weighting trends for fuel efficiency and consequently lower greenhouse gas emissions. The high absorption properties of plastics also allow the vehicle to meet stricter safety standards, while the use of engineering plastics allows for minimization of the mass of parts used in vehicles as they offer more design freedom compared to metals. The emergence and rapid growth of electrically-powered road vehicles have become a key issue for consideration when assessing the automotive outlook and for resulting polymer demand. While the overall number of electric vehicles (EVs) remains at a low level on a global scale, vehicle fleet electrification has gained significant momentum in recent years, supported by regulatory incentives, changing consumer perception and the development of large numbers of affordable electric models by the auto industry. 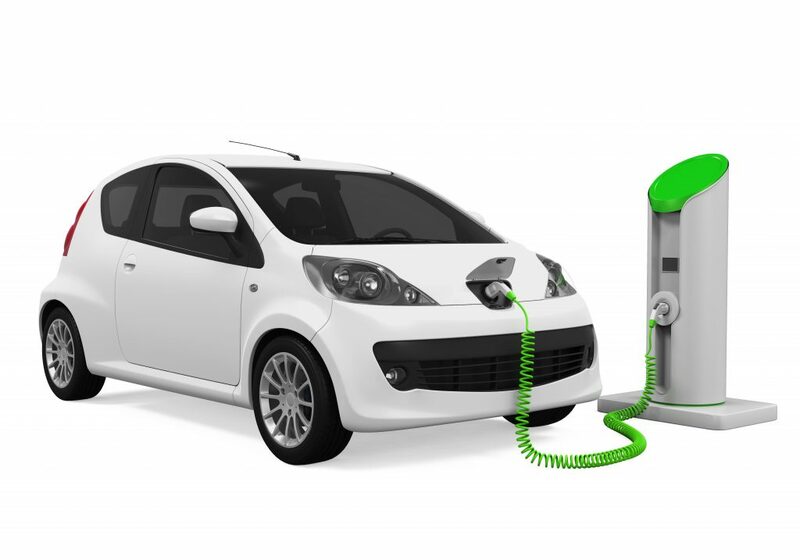 Despite the growth trend for electric vehicles, automobiles that are powered by Internal Combustion Engines (ICE) will remain a significant proportion of the vehicle fleet, with polymer innovation driven by increasing fuel efficiency. The EV vehicle design is not radically different from a traditional ICE vehicle, with the main difference being in the design and use of materials under the hood. However, electric vehicles will not have fuel system, pump, tanks, connecting cables, etc. As the market penetration of electric vehicles increases, polycarbonate (PC) consumption is expected to grow at a faster rate, as PC will be used in sensors and in LEDs in the car. The application of polymer components within engine transmission will become more common as manufacturers seek to squeeze costs and weight. However, the consumption of engineered polymers will be counterweighed by the industry’s emphasis on light weighting, resulting in smaller and lighter components. The light weighting of the battery pack in electric vehicles is viewed as another important trend that will allow EVs to compete with cars using an internal combustion engine. The entire structure of the battery pack offers opportunities of light weighting with the use of engineering polymers and composites. The increase in consumption of plastics such as polypropylene (PP) and polyurethane (PU) in recent years has partially been offset by the decline in consumption of engineering plastics, with PP and PU accounting for about 50% of total plastic consumption in vehicles. 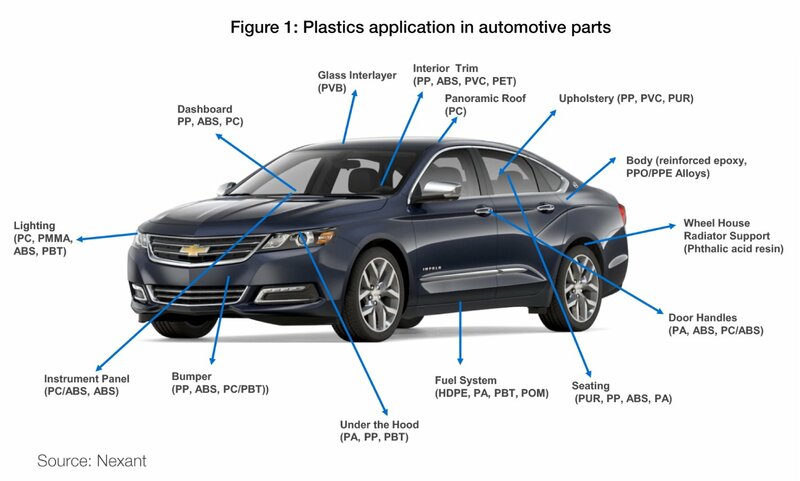 The consumption of engineering plastics is expected to decline due to lesser requirement of these plastics in under-the-hood applications for electric vehicles, as the high temperature resistance of engineering polymers is not required to the same extent as with internal combustion engines. Instead, polyamides will be used for battery brackets and housings in the EVs. 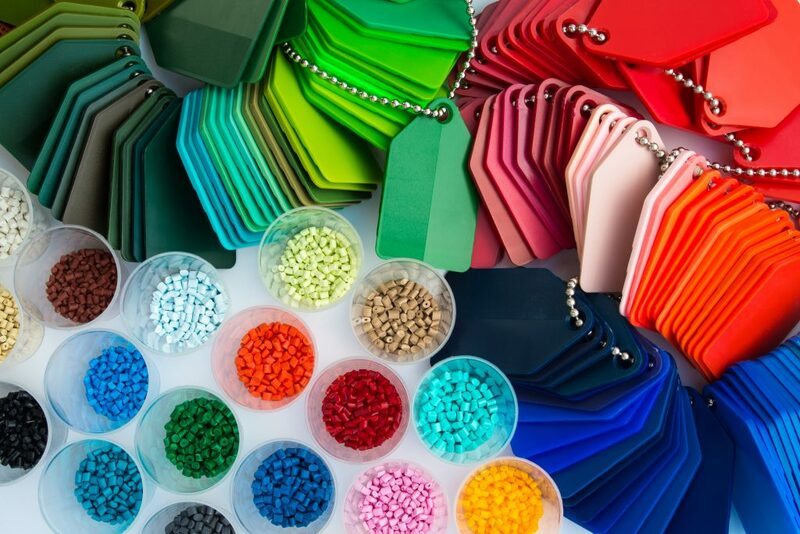 Polypropylene demand will continue to grow as it finds new applications in car interior and exterior, and under the hood replacing some metal parts. In addition, growth will also be spurred by increased production of EVs, which will require lighter parts to help offset the weight of the heavy batteries. PE consumption has also stayed flat as HDPE gas tanks have already penetrated into the gasoline tank market, displacing steel in developed countries. Electric vehicles may, however, use more PE in the engine parts as the high temperature performance of engineering polymers is not required in electric battery engines. ABS consumption is expected to decline as polystyrene and PP composites with improved properties continue to replace ABS in decorative parts in the interior, which was traditionally dominated by ABS, especially in the United States, due to the material’s gloss. The high price of ABS has also supported the substitution with lower priced polypropylene. In some high-end automobiles, the consumption of ABS will increase for the interior with consumers requiring a higher quality design. However, the overall consumption, particularly in North America and Western Europe, will be counterweighed by a reduction in the size of certain modules, such as the front grill, in turn decreasing the consumption of ABS. The growth in polycarbonate will be driven by the emerging application in car sensors (lenses) in autonomous vehicles, supported by continued electrification and lighting requirements in traditional vehicles. Western Europe has a lower consumption of plastics per vehicle than the United States, due to a smaller average size of the car in the region. Plastics consumption (in kg per vehicle) is the lowest in China compared to the other regions. The plastics consumption trends are similar in the US and Western Europe. However, China’s plastics consumption is expected to increase faster than in other regions as it grows from a lower base. Overall, the consumption of polymers in the automotive sector is expected to continue to grow. The growth rates will depend on the plastic type, applications in the automobiles, interpolymer substitution, as well as recycling efforts in different regions. The growth rates of plastics such as PP, PA, PC and PE are expected to increase with the introduction of electric vehicles, while the consumption of engineering plastics is expected to slow down. Engineering plastics emerge as “losers” as the high temperature performance of most of these polymers is not a requirement for electric battery components, the fuel systems or other required ICE parts. China is expected to show higher growth rates than in western countries, as its average plastics consumption is comparatively lower. 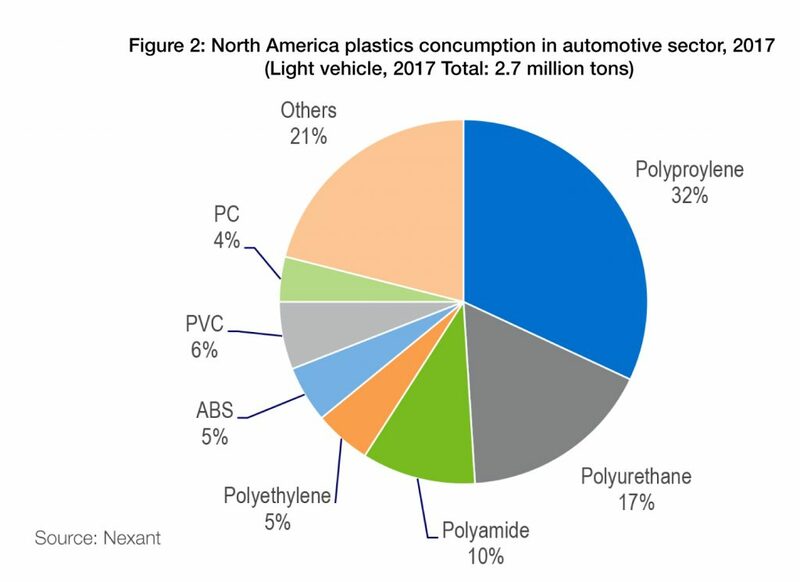 The impact on GCC producers will be very minimal at most due to the small amount of automotive plastic PP compounds being produced and exported out of the region. Production and export of PP compounds is concentrated in Saudi Arabia and led by NATPET and TASNEE. There are also a few suppliers of parts to the automotive industry in the GCC, such as Middle East Specialized Cable Company (MESC) in Saudi Arabia who supply some electronic cables and cable assemblies to Egypt and Turkey and PP bumper injection molders to the local markets in Saudi Arabia and the UAE. Priyanka Khemka is a Consultant in Nexant’s Energy and Chemicals and Consulting Group.